This tour covers the Gobi desert, Terelj and Hustai national parks. 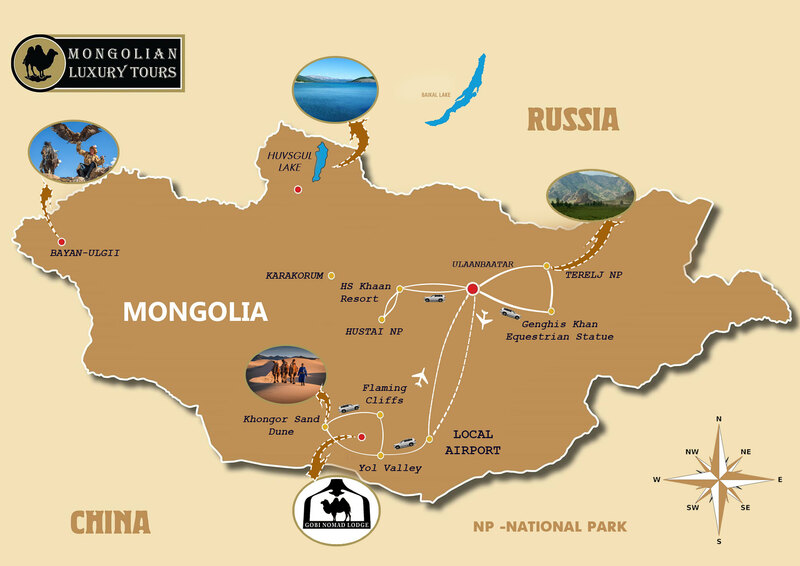 After staying in Ulaanbaatar city and exploring the museums the tour continues with an hour flight to the Gobi desert, amazing terrains with large barren expenses of gravel plains and rocky outcrops and sand dunes. Your four day Gobi tour covers the main attractions such as Bayanzag which was named as Flaming Cliffs by Dr. Roy Chapman Andrews’ expedition because of glowing orange color the sandstone cliffs turned into at the sunset. Since the expedition discovered there the first dinosaur egg nest the world ever seen that site became a famous paleontological site and still attractive for the researches; magnificent Yol valley, deep and narrow gorge in the middle of the Gobi heat, named after the endangered vulture-type bird Lammergeyer where winter ice is kept until middle July; and towering up to 200 meters high whistling Singing Dunes and green grass and stream at the foothills of the dunes which stretch for 185 km. After exploring the Gobi the tour follows to the Terelj-Gorkhi national park named after rhododendron bushes which bloom in May, here you will have to switch your imagination because granite rock of the park will remind you images of animals and people as famous Turtle Rock. During that part of the tour you will visit the Chinggis Khan equestrian statue complex where you will enjoy the surrounding view from the top of the statue. Then the tour will take hour and half drive to Hustai national park8 one of the successful conservational projects of Mongolia and home for re-introduced in early 1990s Przhevalsky horses or wild horses once died out in 1960s. At the park you will be introduced with the conservational efforts and the community based activities of the national park and has a up-close look at the herds of those beautiful horses.